Falling Knife - What Does It Mean? 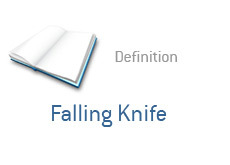 What is the definition of "Falling Knife"? You have probably heard the term "Don't catch a falling knife" used, especially over the past couple of years. Well, let's look at a stock such as AIG. One year ago, AIG was trading at around $45. The company had a pristine reputation, and its business seemed to be sound. Fast forward to September of 2008. The stock is in the midst of an unbelievable freefall and is seemingly losing billions of dollars of market value every day. The stock trades below $30, $25, $20, and by mid September, AIG is trading well below $5. Now, given the overall stature, brand recognition and historical performance of AIG, many inexperienced investors saw the decline as a great chance to load up on a great stock that was suffering through some temporary setbacks. I am personally aware of investors who bought all the way down on AIG, incorrectly figuring that the stock was ripe for a rebound. This didn't happen, as AIG continued to fall through the floor. AIG currently trades at $1.29. These inexperienced investors were guilty of trying to catch a "falling knife". A "falling knife" is a stock that is falling through the floor in price. Inexperienced investors will jump in and buy, usually oblivious to the reasons why the stock may be falling in the first place, drawn by the allure of getting a "good deal" on a stock that is sure to "trade higher". Their rationale for buying the falling stock is usually "well, it was trading much higher just a short while ago and it's a good company, so I will buy". Stocks fall precipitously for a reason, and there is always a reason behind a massive drop. Inexperienced investors who try to "catch a falling knife" usually end up getting cut and taking losses in their positions. This is the definition of a "falling knife".